Adam Polen's Eagle Scout project at Camarillo Height Elementary School turned out fantastic! 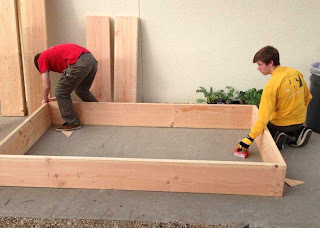 Adam's project was to upgrade existing garden boxes at the school and add three more. His project also included replacing loose gravel around the boxes with walk-on bark to give it a "greener" more inviting look. After lots of planning and organizing, about 15 Scout and family volunteers helped Adam, a member of Boy Scout Troop 225 in Camarillo, complete the project over a weekend in February. 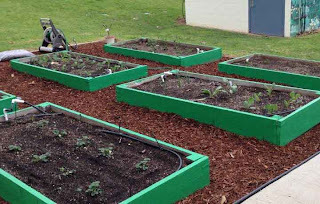 Existing planter boxes were primed and painted. New boxes were built and painted. 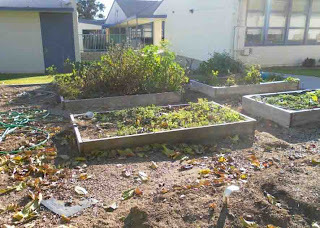 Garden soil was added to the planters along with a variety of vegetable plants. Boxes being primed and painted. Agromin was a happy participant in the project. 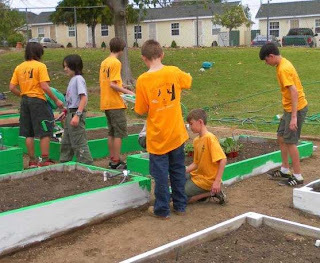 Completing an Eagle Scout project is no easy task. It takes hard work and the type of organizational and people skills that will come in handy in the future. Quite an improvement. This is a "before" photo.